Name These Eaglets: Honor And Glory? Anacostia And Potomac? : The Two-Way Voting began Tuesday and will run until just before midnight on April 24, with five names to choose from. So far, the young birds have been known only as DC2 and DC3. Name These Eaglets: Honor And Glory? Anacostia And Potomac? 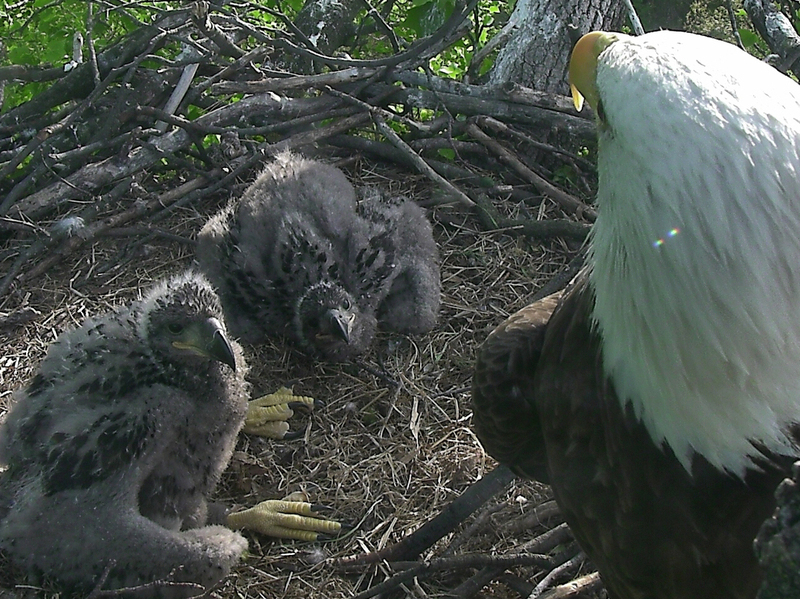 Voting is now open to name two eaglets that were born last month. They're seen here in a recent photo from the National Arboretum in Washington, D.C. They're a month old. The time has come to give names to the two baby eagles that hatched under the watchful eyes of both their parents — and legions of webcam viewers who have been following their growth in the National Arboretum in Washington, D.C.
You can vote on the eaglets' names via the Facebook page for the group Friends of the National Arboretum. Voting began Tuesday and will run through next week, closing just before midnight on April 24. So far, the young birds have been known as DC2 and DC3; they were born last month. And some fans say they like those names — while others say they aren't wild about the five official choices. As Camila wrote for the Two-Way when the second egg hatched, the eagles' fans were already suggesting other names — from Sasha and Malia to Merry and Pippin. Other suggestions made through the Twitter hashtag #namethenestlings include the Rooseveltian Franklin and Eleanor and the astronautic (?) Sally and Neil. "This is the first Bald Eagle pair to nest in this location since 1947," the American Eagle Foundation says, adding that the two parent eagles have been dubbed Mr. President and The First Lady.